We intend to turn this section into a complete shrine for all things FoA, and you are encouraged to contribute! New items will be added as we find the time. At moment this site focuses mainly on the production phase of FOA, displaying scenes and icons that never made it into the game. Most of this more recent content has been provided by ATMachine and we praise him for his efforts. As a first feature we're presenting a comparison shot between the Azores as displayed in FoA, and the actual location as it looks today. As you can see, LEC probably used a photo and only retouched certain parts of the scenery, otherwise it is a perfect match. Also, this interesting background image never made it into the game. It's an earlier version of the "National Archaeology" magazine shot. Oddly enough it survived long enough to be still present in a German preview of FoA, making it likely that it was only replaced shortly before the game was released. 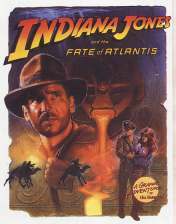 The image has been scanned from a catalog of the German publisher announcing the upcoming release of FoA. 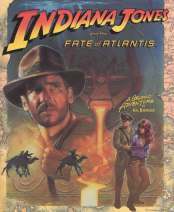 The German text is the equivalent of the English "This was taken a long while ago..."
The White Label two-pack of the games Fate of Atlantis and Indy: the Last Crusade (available in the UK) has a slightly different box art for FoA than the normal one. 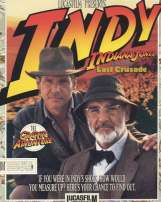 It has the "A Graphic Adventure by Hal Barwood" text as red on a white disc, in a similar fashion to the Last Crusade box, instead of as yellow text. The back of the White Label box shows us this interesting unused fighting interface. As can be seen here, it's quite different from the final one. 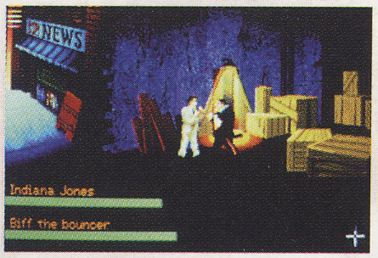 There are no displays for "Punch power" and the names used for Indy and his opponent are longer and more descriptive. Also, the health bars appear to be longer than they are in the final game. As a side note, the phone booth and streetlamp are missing from the pre-release picture, but the newspaper stand is more prominent. Based on this odd interface, I have made a couple of "replica screenshots" which show the interface as it might have looked elsewhere in the game. These two pictures show a fight with a soldier in the Labyrinth on Crete with both the original and the final interfaces. Similarly, these two pictures show a fight with the U-boat Captain in the Team Path. It's obvious that he's no match for Indy. The Lost Dialogue of Plato has been completely changed, as have been some of the colors in the National Archaeology magazine. In addition, the backgrounds for the wax cat figurine, the jar of mayonnaise, and the entrenching tool have been changed from circular to rectangular. However, there are two items which are not even in the final game. One is the green book (Klaus Kerner's passport from the intro), and the other is a yellow necklace. These items would serve no practical purpose, it seems, so that is probably why they were dropped. 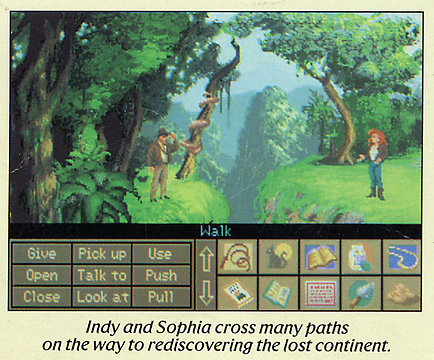 By the way, how can Indy and Sophia be talking across the chasm? That never happens in the final game. Was this part of a puzzle that was removed? Also, by looking at this next screenshot, it appears that the snake was changed from red to green in the final game. I have no good answer as to why. More lost inventory items can be discovered in the resource files of FoA. That reddish case with a handle might have been an early version of the tire repair kit or a German soldier's rations (carried by guards in Atlantis). The piece of paper might have been another version of the telegram seen in the Wits Path of the game. And the yellow necklace shows up again as well. Sophia's office is bigger in the resource files. Here's a picture of the extra room in it, never seen in-game. The Minotaur seen in the Crete Labyrinth was actually the second version produced by the game designers. Here I've compared the two versions. In my opinion, the original version was much more impressive. Here is a "replica screenshot" of Indy standing in the room with the original Minotaur statue. The resource files also contain an extra "hotspot" on the map screens. As this picture shows, the unused destination was Cadiz, Spain. There also was a notation for a "hotspot" in Leningrad, Russia, in the resources, but there was no accompanying picture of a circle to appear on the map. What is interesting is that both Cadiz and Leningrad were featured in Dark Horse's comic book adaptation of FoA! Perhaps these two locations were conceived in early ideas for the game? 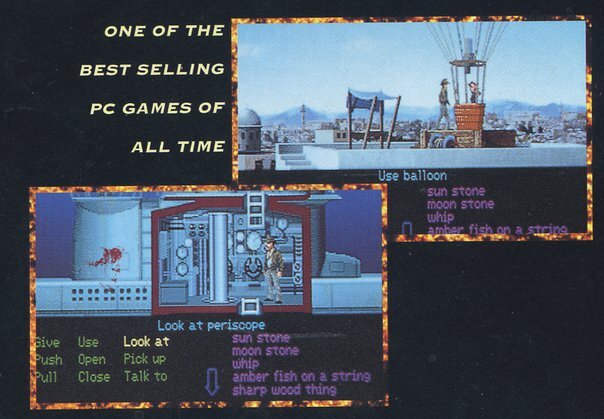 The following image, contributed by USA2004, is a scan of some really old advertisement; amazing part about it is: Its using screenshots that never made it into the game, while both scenes shown ARE in the game: The Balloon-Scene has changed in some minor details, whereas the Submarine has - in the final version - lost the blood-stain, grew a bit bigger and - that's the first thing I actually noticed - does not have the "Flugeldufel" Lever that changes the Subs floatation height. Also, the Ladder is not continous as it is in the final game. But most eyecatching is the GUI, that, while already consisting of the magic 9 verbs, still hast the Secret of Monkey Island/ Last Crusade Look to it! Also, it seems like Indy could do something with the Subs Periscope - maybe an early version of the "Steer the Sub into Atlantis' Airlock" Puzzle? Please contact us with any other unreleased or unused artwork you can find!